</table> The Somali Civil War is an ongoing civil war taking place in Somalia. It began in 1991, when a coalition of clan-based armed opposition groups ousted the nation's long-standing military government. Various factions began competing for influence in the power vacuum that followed, which precipitated an aborted UN peacekeeping attempt in the mid-1990s. A period of decentralization ensued, characterized by a return to customary and religious law in many areas as well as the establishment of autonomous regional governments in the northern part of the country. The early 2000s saw the creation of fledgling interim federal administrations, culminating in the establishment of the Transitional Federal Government (TFG) in 2004. In 2006, the TFG, assisted by Ethiopian troops, assumed control of most of the nation's southern conflict zones from the newly formed Islamic Courts Union (ICU). The ICU subsequently splintered into more radical groups, notably Al-Shabaab, which have since been fighting the Somali government and its AMISOM allies for control of the region. In 2011, a coordinated military operation between the Somali military and multinational forces began, which is believed to represent one of the final stages in the war's Islamist insurgency. Three abandoned Somali National Army (SNA) M47 Tanks sit destroyed near a warehouse following the outbreak of the civil war. After fallout from the unsuccessful Ogaden campaign of the late 1970s, the ruling socialist government of the Somali Democratic Republic under Major General Mohamed Siad Barre began arresting government and military officials under suspicion of participation in the abortive 1978 coup d'état. Most of the people who had allegedly helped plot the putsch were summarily executed. However, several officials managed to escape abroad and started to form the first of various dissident groups dedicated to ousting Barre's regime by force. In May 1986, Barre suffered serious injuries in a life-threatening automobile accident near Mogadishu, when the car that was transporting him smashed into the back of a bus during a heavy rainstorm. He was treated in a hospital in Saudi Arabia for head injuries, broken ribs and shock over a period of a month. Lieutenant General Mohamed Ali Samatar, then Vice President, subsequently served as de facto head of state for the next several months. Although Barre managed to recover enough to present himself as the sole presidential candidate for re-election over a term of seven years on December 23, 1986, his poor health and advanced age led to speculation about who would succeed him in power. Possible contenders included his son-in-law General Ahmed Suleiman Abdille, who was at the time the Minister of the Interior, in addition to Barre's Vice President Lt. Gen. Samatar. By that time, the moral authority of Barre's ruling Supreme Revolutionary Council (SRC) had collapsed. Many Somalis had become disillusioned with life under military dictatorship. The regime was further weakened in the 1980s as the Cold War drew to a close and Somalia's strategic importance was diminished. The government became increasingly totalitarian, and resistance movements, encouraged by Ethiopia's communist Derg administration, sprang up across the country. This eventually led in 1991 to the outbreak of the civil war, the toppling of Barre's regime and the disbandment of the Somali National Army (SNA). Among the militia groups that led the rebellion were the Somali Salvation Democratic Front (SSDF), United Somali Congress (USC), Somali National Movement (SNM) and the Somali Patriotic Movement (SPM), together with the non-violent political oppositions of the Somali Democratic Movement (SDM), the Somali Democratic Alliance (SDA) and the Somali Manifesto Group (SMG). Many of the opposition groups subsequently began competing for influence in the power vacuum that followed the ouster of Barre's regime. In the south, armed factions led by USC commanders General Mohamed Farah Aidid and Ali Mahdi Mohamed, in particular, clashed as each sought to exert authority over the capital. UN Security Council Resolution 733 and UN Security Council Resolution 746 led to the creation of UNOSOM I, the first mission to provide humanitarian relief and help restore order in Somalia after the dissolution of its central government. United Nations Security Council Resolution 794 was unanimously passed on December 3, 1992, which approved a coalition of United Nations peacekeepers led by the United States. Forming the Unified Task Force (UNITAF), the alliance was tasked with assuring security until humanitarian efforts aimed at stabilizing the situation were transferred to the UN. Landing in 1993, the UN peacekeeping coalition started the two-year United Nations Operation in Somalia II (UNOSOM II) primarily in the south. UNITAF's original mandate was to use "all necessary means" to guarantee the delivery of humanitarian aid in accordance to Chapter VII of the United Nations Charter, and is regarded as a success. Some of the militias that were then competing for power interpreted the UN troops' presence as a threat to their hegemony. Consequently, several gun battles took place in Mogadishu between local gunmen and peacekeepers. 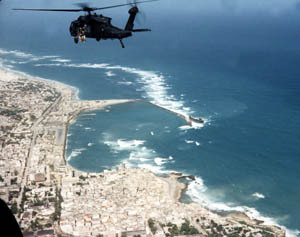 Among these was the Battle of Mogadishu in 1993, an unsuccessful attempt by US troops to apprehend faction leader Aidid. UN soldiers eventually withdrew altogether from the country on March 3, 1995, having incurred more significant casualties. Following the outbreak of the civil war and the ensuing collapse of the central government, Somalia's residents reverted to local forms of conflict resolution; either secular, traditional or Islamic law, with a provision for appeal of all sentences. The legal structure in Somalia is thus divided along three lines: civil law, religious law and customary law. The early 2000s saw the creation of fledgling interim federal administrations, with the Transitional National Government (TNG) established in 2000 followed by the formation of its successor the Transitional Federal Government (TFG) in 2004. In 2006, the Islamic Courts Union (ICU), an Islamist organization, assumed control of much of the southern part of the country and promptly imposed shari'a law. The Transitional Federal Government sought to reestablish its authority. With the assistance of Ethiopian troops, African Union peacekeepers and air support by the United States, the reconstituted Somalian military managed to drive out the rival ICU and solidify the TFG's rule. In November 2010, a new technocratic government was elected to office, which enacted numerous reforms. Among these, in its first 50 days in office, the new administration completed its first monthly payment of stipends to government soldiers, and initiated the implementation of a full biometric register for the security forces within a window of four months. By August 2011, the new government and its AMISOM allies had managed to capture all of Mogadishu from the Al-Shabaab militants. An ideological rift within Al-Shabaab's leadership also emerged in response to pressure from the recent drought and the assassination of top officials in the organization. In October 2011, a coordinated operation between the Somali military and the Kenyan military began against the Al-Shabaab group of insurgents in southern Somalia. The mission was officially led by the Somali army, with the Kenyan forces providing a support role. In early June 2012, Kenyan forces were formally integrated into AMISOM. Analysts expect the additional AU troop reinforcements to help the Somali authorities gradually expand their territorial control. ↑ "Somalia signs deal with militia - Africa". Al Jazeera English. 16 March 2010. http://english.aljazeera.net/news/africa/2010/03/20103165416919724.html. Retrieved 9 July 2011. ↑ "Twentieth Century Atlas – Death Tolls and Casualty Statistics for Wars, Dictatorships and Genocides". Users.erols.com. http://necrometrics.com/20c300k.htm#Somalia. Retrieved 2011-04-20. ↑ Heinlein, Peter (October 22, 2011). "E. African Nations Back Kenyan Offensive in Somalia". http://www.voanews.com/english/news/africa/East-African-Nations-Back-Kenyan-Offensive-in-Somalia-132374053.html. Retrieved October 23, 2011. ↑ Ahmed III, Abdul. "Brothers in Arms Part I". WardheerNews. http://wardheernews.com/Articles_2011/Oct/29_Brothers_in_Army_abdul.pdf. Retrieved February 28, 2012. ↑ 11.0 11.1 World of Information (Firm), Africa review, (World of Information: 1987), p.213. ↑ 12.0 12.1 Arthur S. Banks, Thomas C. Muller, William Overstreet, Political Handbook of the World 2008, (CQ Press: 2008), p.1198. ↑ "United Nations Operation In Somalia I – (Unosom I)". United Nations. http://www.un.org/Depts/DPKO/Missions/unosomi.htm. Retrieved 2012-01-29. ↑ "Operation Restore Hope". http://www.globalsecurity.org/military/ops/restore_hope.htm. Retrieved 2008-01-15. ↑ 18.0 18.1 Central Intelligence Agency (2011). "Somalia". The World Factbook. Langley, Virginia: Central Intelligence Agency. https://www.cia.gov/library/publications/the-world-factbook/geos/so.html. Retrieved 2011-10-05. ↑ Dr Andre Le Sage (2005-06-01). "Stateless Justice in Somalia". Centre for Humanitarian Dialogue. http://www.hdcentre.org/files/Somalia%20report.pdf. Retrieved 2009-06-26. ↑ "Ethiopian Invasion of Somalia". Globalpolicy.org. 2007-08-14. http://www.globalpolicy.org/component/content/article/153/26334.html. Retrieved 2010-06-27. ↑ 21.0 21.1 Online, Garowe (2011-01-12). "Somalia President, Parliament Speaker dispute over TFG term". Garoweonline.com. http://www.garoweonline.com/english/index.php?option=com_content&view=article&id=558:somalia-president-parliament-speaker-dispute-over-tfg-term&catid=55:somalia&Itemid=79. Retrieved 2011-06-12. ↑ United Nations High Commissioner for Refugees (2009-05-01). "USCIRF Annual Report 2009 – The Commission's Watch List: Somalia". Unhcr.org. http://www.unhcr.org/refworld/publisher,USCIRF,,,4a4f272bc,0.html. Retrieved 2010-06-27. ↑ "Somalia: Guide to Puntland Election 2009". Garoweonline.com. 2008-12-25. http://www.garoweonline.com/artman2/publish/Somalia_27/Somalia_Guide_to_Puntland_Election_2009.shtml. Retrieved 2011-06-12. ↑ "Opening Annual General Assembly Debate, Secretary-General Urges Member States to Press in Tackling Poverty, Terrorism, Human Rights Abuses, Conflicts". Unis.unvienna.org. http://www.unis.unvienna.org/unis/pressrels/2005/ga10386.html. Retrieved 2011-06-12. ↑ "Somalia's president quits office", BBC News, December 29, 2008. ↑ "Somali President Yusuf resigns", Reuters (FT.com), December 29, 2008. ↑ Kamaal says: (2010-05-22). "UN boss urges support for Somalia ahead of Istanbul summit". Horseedmedia.net. http://horseedmedia.net/2010/05/un-boss-urges-support-for-somalia-ahead-of-istanbul-summit/. Retrieved 2010-06-27. ↑ "Islamists break Somali port truce". BBC News. 2009-10-21. http://news.bbc.co.uk/2/hi/africa/8318798.stm. Retrieved 2010-06-27. ↑ Independent Newspapers Online (2011-08-10). 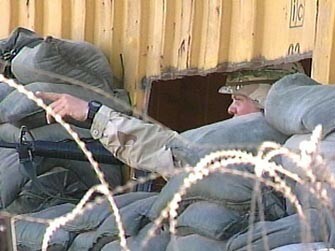 "Al-Shabaab ‘dug in like rats’". Iol.co.za. http://www.iol.co.za/news/africa/al-shabaab-dug-in-like-rats-1.1114585. ↑ Chothia, Farouk (2011-08-09). "Could Somali famine deal a fatal blow to al-Shabab?". BBC. http://www.bbc.co.uk/news/world-africa-14373264. ↑ "Somalia government supports Kenyan forces' mission". Standardmedia.co.ke. http://www.standardmedia.co.ke/agriculture/InsidePage.php?id=2000045933&cid=4&. ↑ "Kenya: Defense Minister appointed as acting Internal Security Minister". 19 June 2012. http://www.garoweonline.com/artman2/publish/Somalia_27/Kenya_Defense_Minister_appointed_as_acting_Internal_Security_Minister.shtml. Retrieved 20 June 2012. ↑ "Kenya agrees to join AMISOM". China Daily. 2011-12-07. http://www.chinadaily.com.cn/world/2011-12/07/content_14225808.htm.